April 21, 2015: On April 22nd, millions of people around the world will gather together at festivals and other events to celebrate our beautiful blue planet. It’s Earth Day, an occasion to pause, reflect, and talk about how to sustain a clean, healthy environment on Earth. This year, Earth Day will end with a meteor shower. On April 22-23, Earth will pass through a stream of debris from Comet Thatcher, source of the annual Lyrid meteor shower. As Earth crosses the debris zone, flakes of comet dust, most no bigger than grains of sand, strike Earth's atmosphere traveling 49 km/s (110,000 mph) and disintegrate as streaks of light. Typical Lyrids are about as bright as the stars of the Big Dipper. "Shooting stars [were] observed on Wednesday morning last at Richmond and its vicinity, in a manner that alarmed many, and astonished every person that beheld it. From one until three in the morning, those starry meteors seemed to fall from every point in the heavens, in such numbers as to resemble a shower of sky rockets..."
about 15 minutes, and could not then number them all." No such outburst is predicted for 2015—but then again, no outbursts were predicted on those previous occasions either. If you’re up late, take a look. The best time to catch the shower is between about 11 pm on April 22nd and sunrise on April 23rd, in any timezone in the northern hemisphere. Observing tips: Dress warmly. Bring a reclining chair, or spread a thick blanket over a flat spot of ground. Lie down and look up. 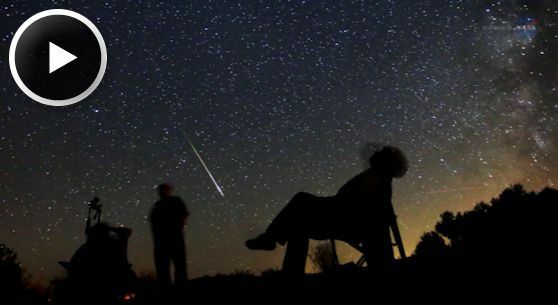 Meteors can appear in any part of the sky, although their trails will tend to point back toward the constellation Lyra, from which the meteors get their name. The hours before dawn are best, because that is when Lyra is highest in the sky. Sometimes, bright moonlight can spoil a meteor shower. That will not be the case on April 22nd. The Moon is just a slender crescent, and it sets shortly after sunset, so lunar glare will not interfere with the Lyrids. If you can, get away from city lights for the darkest possible sky and the best possible show. Enjoy Earth Day. And then enjoy Earth Night even more.